Prev I Love My Children’s Birthdays But Not All the Gifts! So I Decided To Try Something Different. Next Raisin Box Valentines! The 2014 Winter Olympics have got underway in Sochi, Russia. 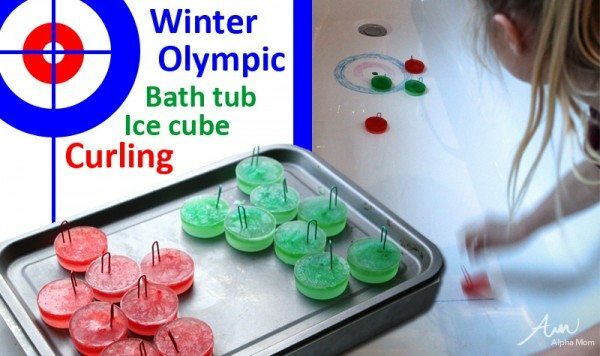 We don’t have the weather, the equipment, or the nerve to try our hand at bobsledding or ski jumping, but we can certainly get to know a bit more about the sport of curling, with the help of our bathtub and some easy to make ice-cube curling stones. First, I’ll show you how we set up our Ice Cube Curling Game, then I’ll give you some Curling lingo and explain how the scoring works. Curling involves using the low-friction sliding of a smooth polished granite rock on an ice surface. 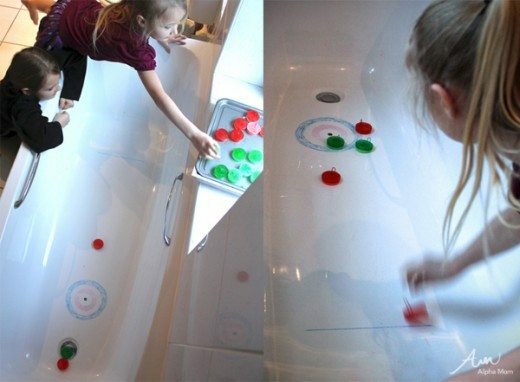 We switched things around in our game to have ice cubes sliding on the smooth surface of the bathtub in order to play a mini game at home. 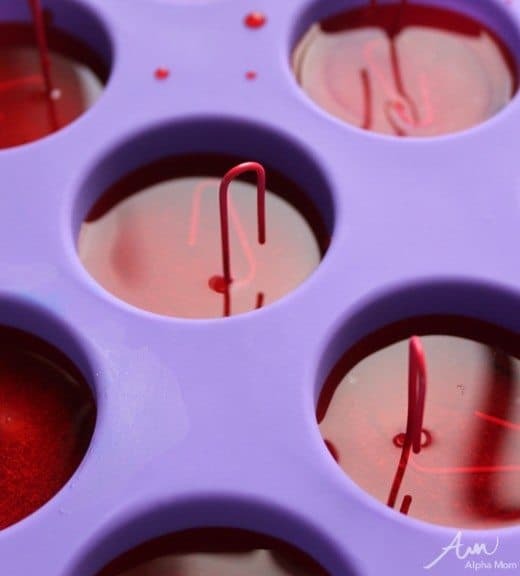 To make our ice-cube curling stones, we just used a silicone mini muffin tray, some food coloring, and paperclips. 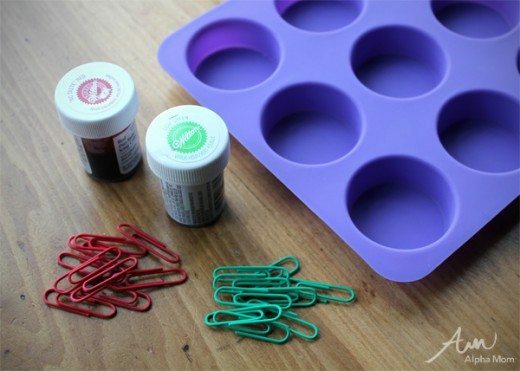 The mini muffin tray we had was from an inexpensive kid’s baking set, but any sort of mini muffin tray or flat bottomed ice cube tray should work, as long as your frozen curling stones are going to be able to slide along the bathtub bottom without falling over. 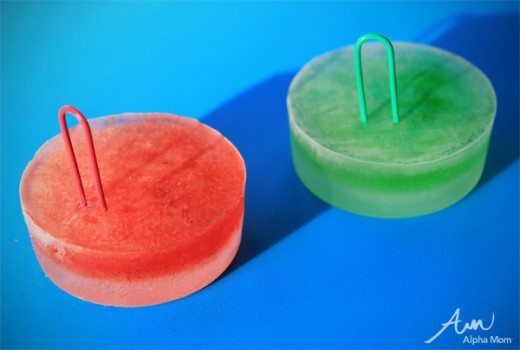 The ice cubes were frozen in three layers, so that the paper clip could be set into it without it scratching the tub, and a thin layer of colored ice could be layered in the middle too. You don’t really need to bother with the layer of color if you don’t want to. We had colored paper clips to make the handles on ours, so we could have just frozen them in two steps rather than three if we skipped the layer of colored ice. 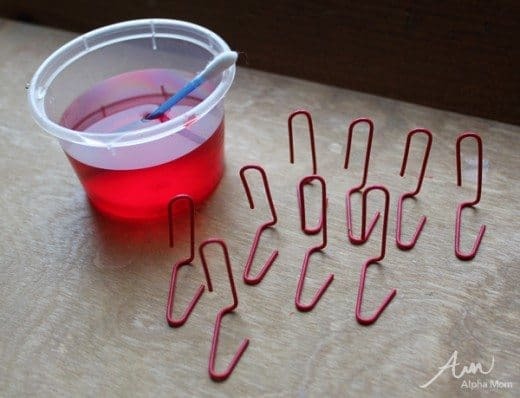 First layer to freeze was a good two to three millimeters of water, then when that was frozen we bent all our paper clips so that they would stand up like in the image below and mixed up some red food coloring in a bit more water. We stood up the paperclips on the first layer of ice, and then added just enough colored water to cover the paper clip base and then froze them in place. The final layer to freeze was another layer of water to fill the tray to the top. Below you can see the two colors of ice cube curling stones we made and the layers that were formed, leaving the larger half of the paperclip sticking out of the ice to be used as a handle, whilst the other part of it is firmly embedded in the ice. Once you have your ice-cube curling stones ready, pop them out of the tray and leave them in the freezer until you have everything ready to play. Depending on the temperature of your house, you’ll have only 20 or 30 minutes of game time with them before the bottom melts away to the base of the paperclip. Your two teams (in our case red and green) each have eight curling ice cubes. They take it in turns to slide an ice cube from behind the line drawn at one end of the bath tub down towards the target (called a “house”) at the other end. The aim is to have one of your ice cubes be the closest to the center of the target (the center of the “house” is called the “button”). We used regular crayons to draw the “house” onto the bottom of our plastic bathtub. The water melting from the ice cubes did not affect it, but it was able to be cleaned off easily with a baby wipe when we were done. 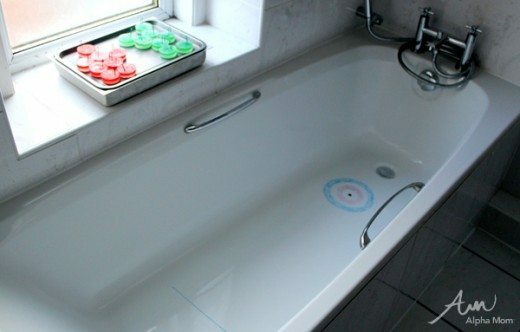 In the real sport, the curling sheet that you play on has a house at both ends and the teams alternate which end they play towards each round, but I doubt anyone has a bathtub long enough to accommodate that, so we just had the one home for our game. 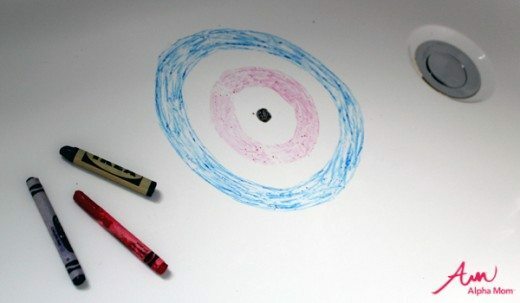 Once you have played all sixteen of the curling ice cubes, the way the round (called an “end”) is scored is to look and see how many of the winning color’s ice cubes are closer to the button than the nearest ice cube belonging to the opposing team. 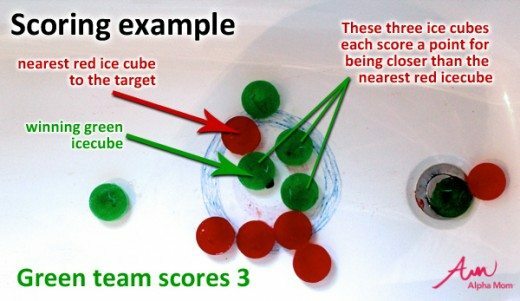 In the example below you can see that three of the green team’s ice cubes are closer to the button than any of the red team’s ones, and so the green team scores three points in this end. Only the team that wins the “end” scores points, so here the red team does not score anything. A game is made up of ten “ends,” and the winning team is the one that has scored the most points in total across all the “ends” played, so you’ll need to keep a tally during your game. Unless your bathroom is like a sauna, you should be able to get a full ten ends played before the ice cubes are have melted too much to play anymore, and if you keep your bent paper clips once the ice cubes have melted, it will be easy-peasy to make-up another batch of ice-cube curling stones next time you want to play. Of course there is a lot more to the sport of curling than we can squeeze into this simple game of bathtub ice cube curling. For example the “sweepers” play an important part in the real game of curling, and the spin given to the curling stones also comes into play, among other things. But this is a great way to give kids an introduction to a sport that most people have never really had much of a clue about. Coincidentally the purpose-build stadium that is going to host the Olympics’ Curling competition in Sochi this year is actually called “The Ice Cube Curling Center!” So now you have learned a little bit about the sport, why not enjoy some of the real matches taking place over the next couple of weeks during the Winter Olympics. It may look a little odd at first glance, but give Curling a chance. It’s actually pretty cool (pun intended!). You can find the full schedule of Curling matches here. The women’s gold medal and men’s gold medal curling games are scheduled for the 20th and 21st of February, respectively. Enjoy! no offense, but it’s a house, not a home. Close! looks like a fun thing to do, though. oh dear, that was a silly mistake for me to make! Thanks for pointing it out. Weirdly I did know it was called a house, but my brain was obviously misbehaving when I wrote this up. Not the first time this week either. I wrote a whole email to someone about rendering brickwork when I meant pointing too. I’m going to blame it on not enough sleep with a new baby in the house 😉 Will fix the mistake above ASAP! BTW the blue line down at the other end is called the hog line – in the real game you have to let go of the rock before it crosses the line. Might make the bathtub game more challenging! Cool stuff! We never got the chance to play growing up, but the stones were made at a small workshop in the village where I lived. Made from blue Welsh Granite. The locals used to use the cubes that the initial cylinder shapes were milled out of as planters in their front yards 🙂 it’s all done up in Scotland now though.